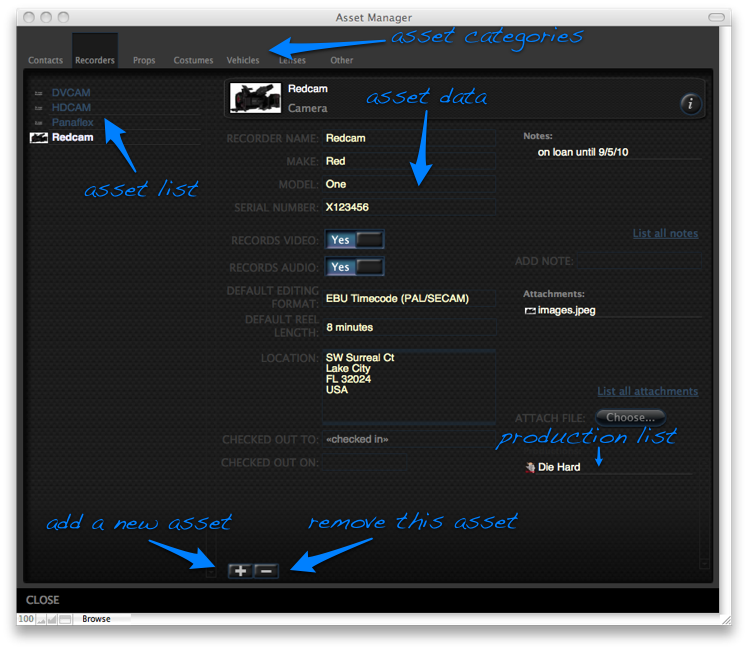 From here you can create and load new productions, open the asset manager, and perform other functions. The new production is shown in the middle of the screen. 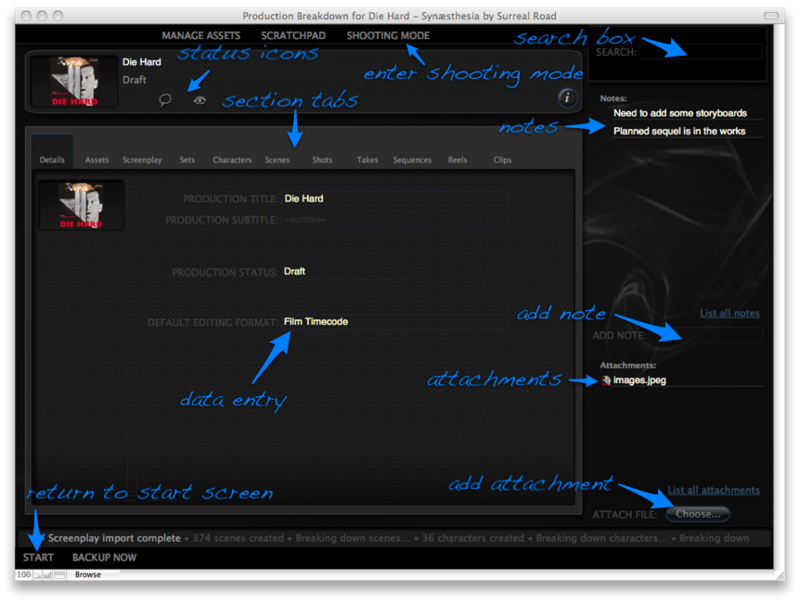 Different areas of the production are separated by tabs, with areas for attachments and notes, and a search box. Editable fields are indicated by a blue border. Any data you have entered will be in yellow. Depending upon the type of data required, you can either type into the field directly, or a panel will appear (for entering dates, choosing other items in a production, specifying timecodes, and so on). The note will be added to the notes list. 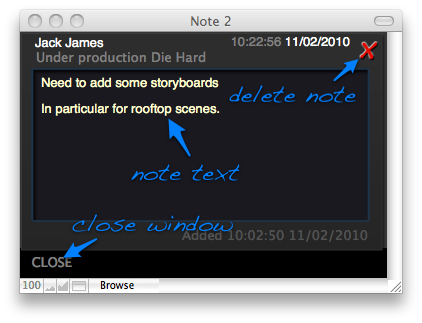 The note window will appear. You can edit the note as needed. If you attach an image to the current breakdown, Synaesthesia will use that as a thumbnail for that item, so it's a good idea to attach at least one image to each item you create for reference. When items are removed, they are not permanently deleted, but sent to Synaesthesia's trash, where they can be recovered later. This will "spool" the navigation bar along, so just click on the end item until the one you are after appears in the bar. 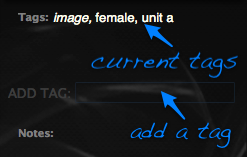 Tags are used to group different items together. You can add as many tags as you like to each item. Some tags are created automatically by Synaesthesia. For example, if a scene is set at night, it will automatically be tagged with "night". 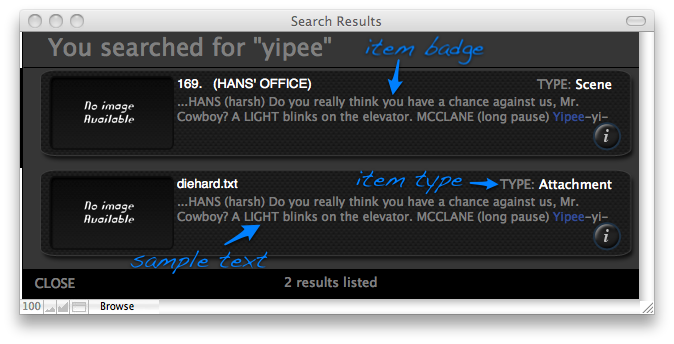 You can search by keyword for any item from any breakdown. You can add tags, and lock and protect items from this window. Locking an item prevents it from being edited. Protecting an item prevents it from being deleted. Either way, a map of the location will be saved for future viewing (note that the map and search functionality require an internet connection). 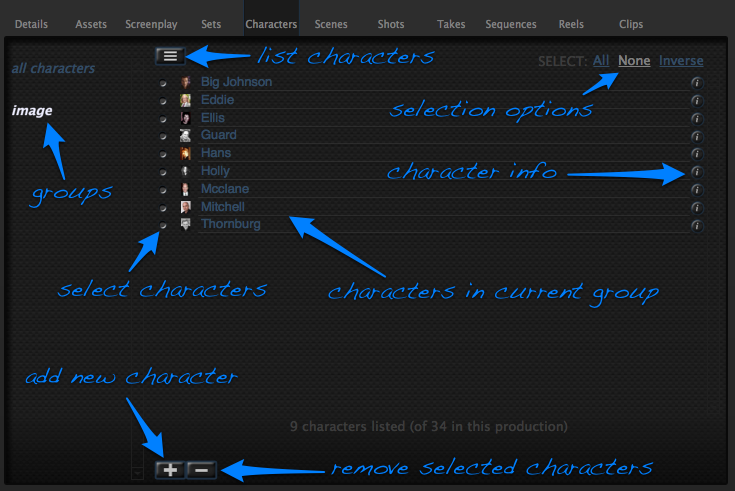 You can import a screenplay for each production from a properly formatted text file. Synaesthesia will automatically create scenes, sets and characters from the screenplay, so this can be a really quick way to get all that data in. Synaesthesia will import the text, then break down characters, sets and scenes from it. If you have already created characters, sets or scenes, Synaesthesia will update them with the new information. You can even import revised screenplays later and Synaesthesia will update the previous version, omitting and creating scenes as needed. Assets are items (such as cameras, vehicles and even people), that are shared between productions. These are managed via the "Asset manager" window. Synaesthesia has a special "shooting mode" that allows you to easily enter data during a shoot, creating takes and other items as you go. 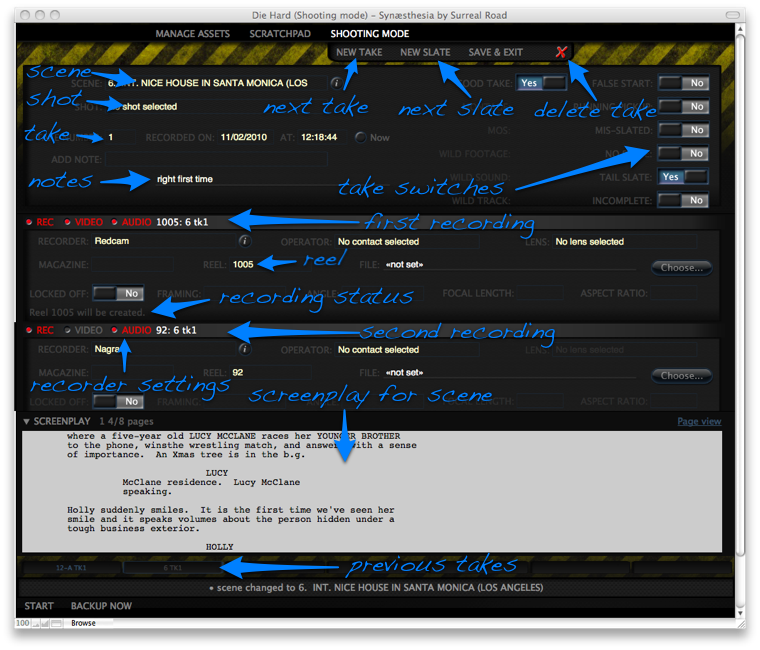 Shooting mode uses the recorders attached to the current production to determine what to record. Change the Type field to "Recorders"
A new slate indicates that the current scene and/or shot has changed, and the take number is reset. The take number increases by 1. Disable a recording to tell Synaesthesia that it is not recording the current take. The recording status will be updated accordingly. You can import sequences from an EDL from an editing system. 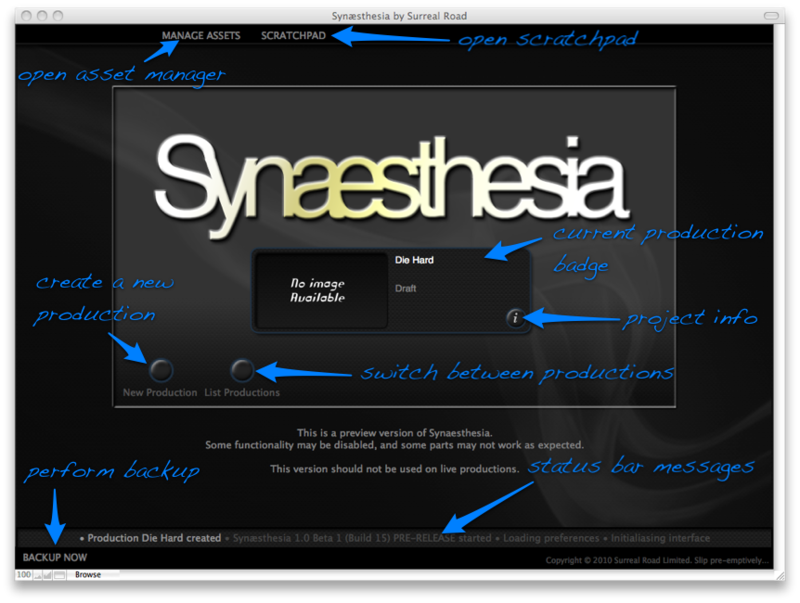 Synaesthesia will automatically link edits to clips already in the system. Synaesthesia will import the EDL and validate it. This process can take some time, so check the status bar at the bottom to keep an eye on its progress. If you have already created reels and clips, Synaesthesia will match events in the sequence to them. You can even import as many different sequences as you like, and you can even merge events from multiple sequences.